Facadeal Poetry is the composition of animated literary works that are projected on the facades of buildings and respond to the geography, composition, and use of the building to create situated works of digital literature. The inspiration behind my piece comes from the emptiness of the night, and the drive to produce a sort of public literature that will engage students and passerbys with works that large and engrossing. Literature as a sort of spectacle, taken from the intimate space of books, and libraries and placed onto the public space of a facade. Projected works of digital art and literature are nothing new, but the problem with most of these sorts of works is that they do not respond to the surface they employ, be it a wall, a chalk board, or a pull down screen. They ignore the particular context of the space and surface they engage, cheapening the works projected and making the projection feel superfluous. It could be enjoyed indoors, or on a personal screen. I like the idea of composing poetry for a space. Not just about a space, but physically for it, responding to the way it is made and can be viewed. Facedeal Poetry will require powerful digital projection technology, and somewhat basic animation software, such as Flash, or possibly, Adobe AfterEffects. The projector will be instrumental in casting the image on to selected services, while the animation software will enable textual authorship to consider new dimensions of movement, placement and transition. I would hope that the reader will encounter the project 'accidentally' either by fortune of their passing by, or by necessity as the projected surface is on their way from one place on campus to another. 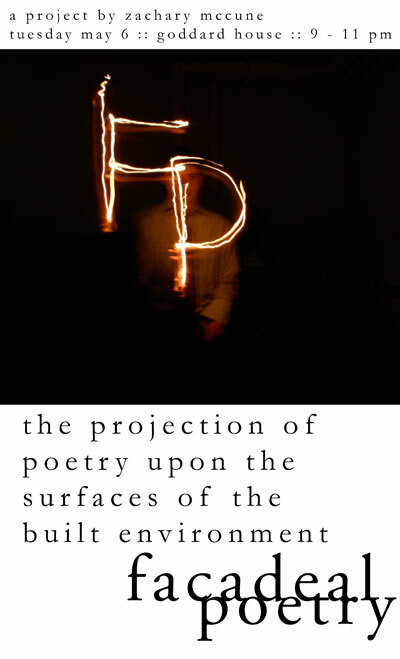 Unaware of the project, the individual, would-be reader is suddenly made aware of the piece when an animated sequence of projected light catches their eye, and begs them to gaze at the piece. Pausing the individual reader, considers the piece as a series of sequential texts unfolding in a timed sequence. They may ask other people standing about the piece what it is and/or what it means. They see enough, they move on, they might return they might not. Poor projection technology: I need to find a good powerful projector to be visible in ambient streetlighting, on the surface of buildings, as projected from about 45 - 75 feet. I have tried a 600 lumens projector and it is faint but legible at a distance of about 50 feet. Lack of participation/reason to engage with the piece: I have been considering how I want people to engage with the work and if they will stop for it, out of simple curiosity. I am also interested in harvesting reactions to the piece or to the opportunity to be projected, (to be larger, higher than oneself is a compelling reason to engage an art piece). The one where the guy projected single letters on buildings.